Since 1927 the annual Macy's Thanksgiving Day Parade has been filling the skies of New York with colourful balloon representations of pop culture icons. Video games didn't enter the picture until 1993, and only three gaming icons have made the cut so far. The annual Macy's Thanksgiving Day Parade (often shortened to Macy's Day Parade) has been a US tradition since 1924. For many families the event is as much a part of the Thanksgiving Day celebration as the feast itself, parents and children gathering in the streets of New York City or pajama-clad in front of their television sets on Thanksgiving morning. Since then New York's streets have received annual visits from a number of well-known characters. In 1934 Mickey Mouse made his big Macy's Day Parade debut, followed in 1935 by Donald Duck. Superman took to the skies in 1939. Popeye advertised the merits of eating spinach in 1957, while 1965's Underdog was a favourite among children. They even had a giant Hello Kitty floating in the sky way back in 1974. Kids sat glued to their television sets on those special Thursday November mornings, eagerly awaiting the appearance of their favourite cartoon characters. And while video games were big in the 1980s, it wasn't until 1993 that a character resonated enough with pop culture to achieve balloon status. That character was Sonic the Hedgehog. 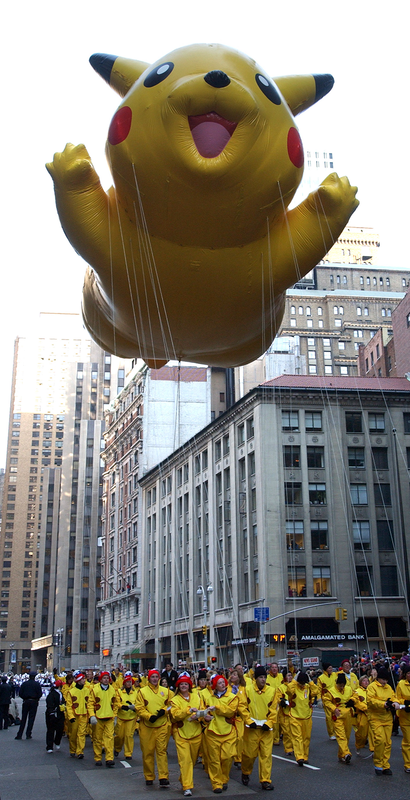 While money certainly plays a part in which balloons show up in the Macy's Day Thanksgiving Parade procession — as of 2006 the starting cost of having a balloon crafted and appear in the parade was said to be $US190,000 — a property must hold a certain appeal for it to be considered. Otherwise we'd be flooded with inflatable ads every year. Sega's sassy, spiky-haired mascot had the kind of mass appeal that made him perfect for a massive inflatable appearance. 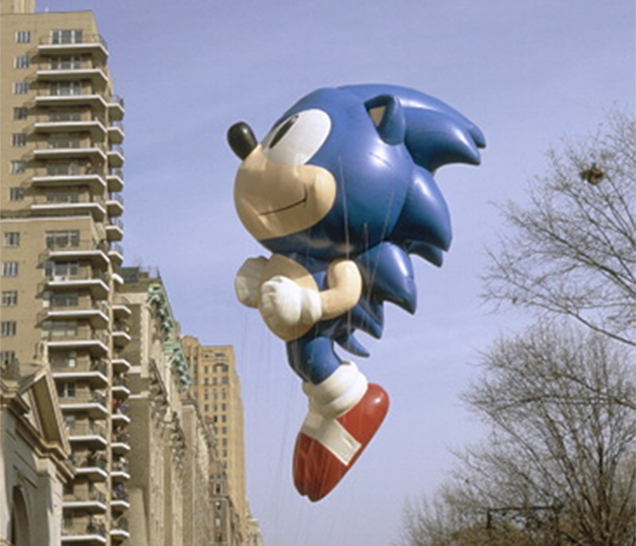 Sonic was the only video game character to make an appearance in the Macy's Day parade for eight years, with his rival, Mario, nowhere to be seen. The Plumber has never had a balloon in the parade, but another popular Nintendo character has made several appearances, starting in 2001. By November 2001, six different Pokémon games had been released in North America, and millions of children were in the thrall of an electric mouse. 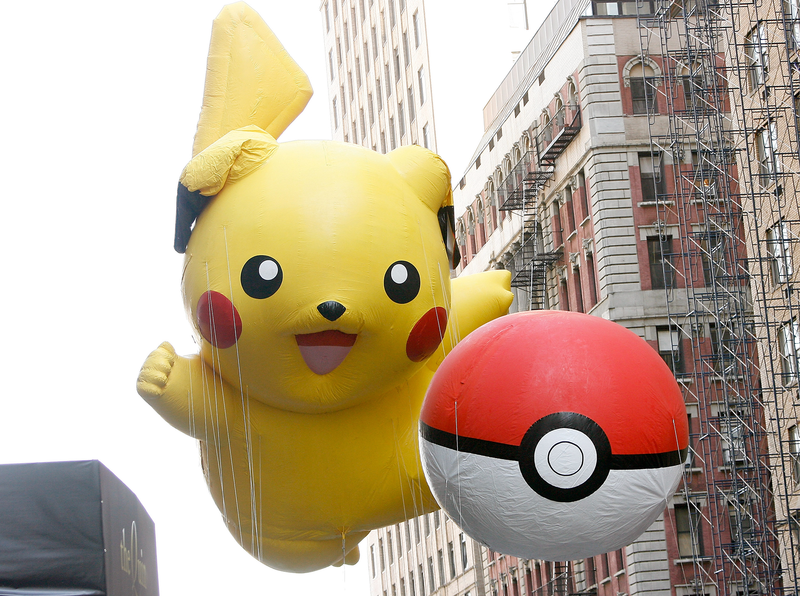 Pikachu is one of the most rapidly-rising stars in video game history, and so he became a rapidly-rising balloon in 2001's Macy's Thanksgiving Day festivities. Pikachu quickly became one of the parade's star attractions, and like many recurring characters, he's received a refresh. In 2006 the Pokémon mascot scored a fresh pose and one of the easiest accessories Macy's balloon makers Raven Aerostar has ever had to construct — the Pokéball. In 2011 the first Macy's Day video game balloon got a refresh as well. 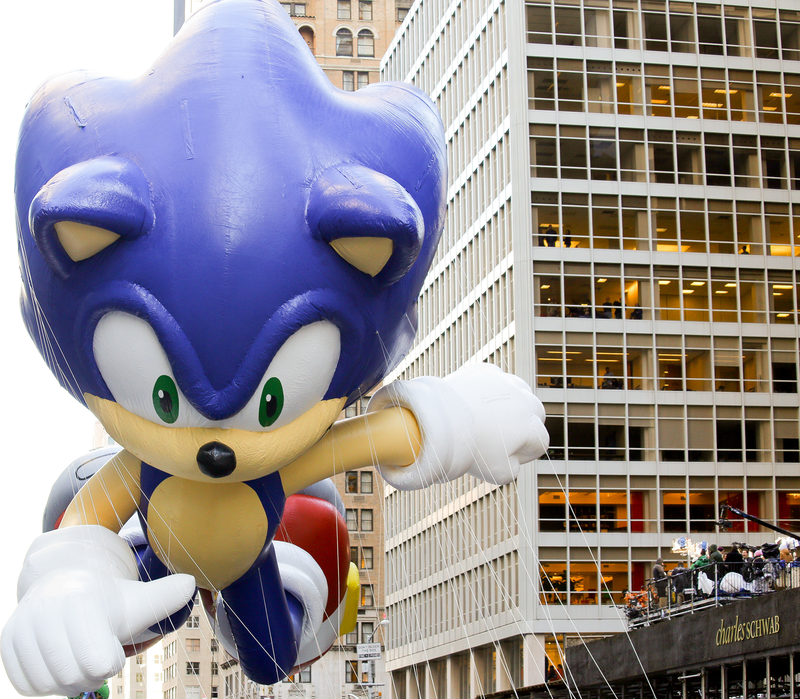 That original Sonic the Hedgehog balloon was dated the day it debuted. The new model portrayed a sleeker, hipper, spikier hedgehog. That brings us to 2014. Tomorrow's Macy's Thanksgiving Day Parade will feature a pair of video game character balloons, one a refresh of an old favourite, the other completely new. 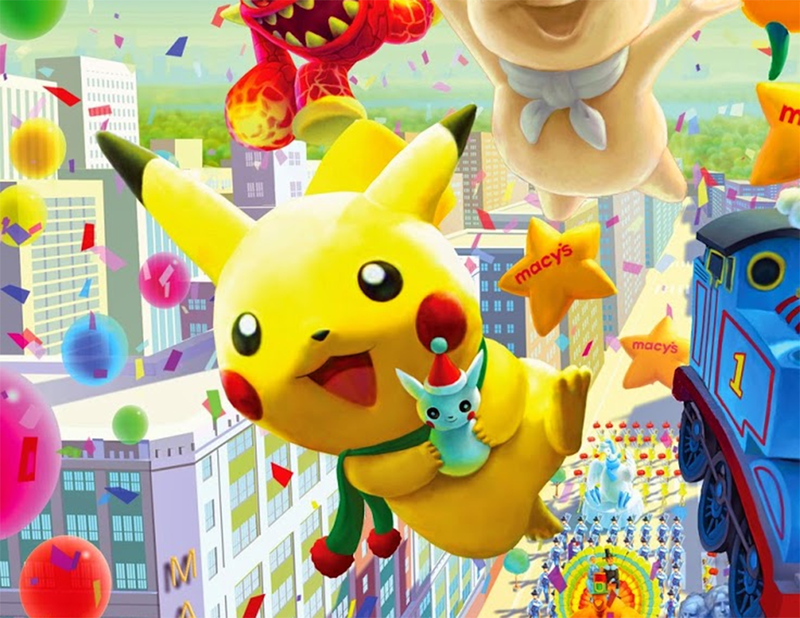 As seen in promotional posters for the event, Pikachu is donning festive garb for his third balloon incarnation. The foot-up pose suggests a retooling of the second Pikachu balloon, with new arms gripping a snow-built version of himself and a very fancy scarf. And the third video game character to appear as a Macy's Thanksgiving Day Parade balloon is... Eruptor? Eruptor was one of the earliest figures appearing in Activision's Skylanders series of toy-based video games. The annual franchise has proved wildly popular among children (and adult collectors), a fact that grants the property two of the main criteria for inclusion in the big event — resonating with children, and the money necessary to have a balloon constructed and featured in the parade. 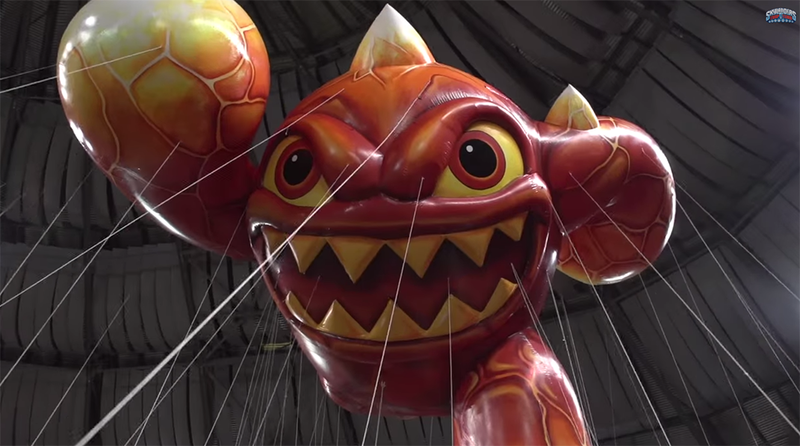 "Any time I mention we have Eruptor in the parade to a kid, they just light up," said Amy Kule, executive producer of the Macy's Thanksgiving Parade in a promotional video released by Activision. "For me that's the best test there is." 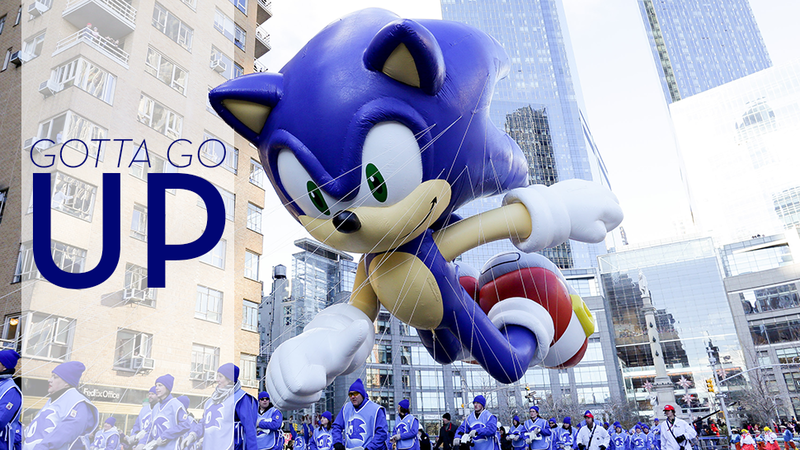 Who'll be the next video game character to float down the parade route? The 88th annual Macy's Thanksgiving Day Parade takes place in New York City on Thursday, November 27. I find it sad how eruptor got into the parade before Spyro.